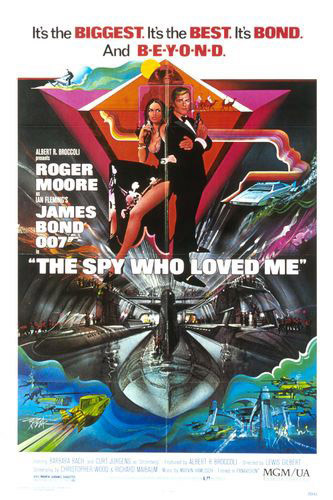 The Spy Who Loved Me (1977) is the tenth spy film in the James Bond series, and the third to star Roger Moore as the fictional MI6 agent James Bond. It was directed by Lewis Gilbert and the screenplay was written by Christopher Wood and Richard Maibaum. The film takes its title from the tenth novel in Ian Fleming's James Bond series, though as Ian Fleming requested that only the title of the novel be used, the film does not contain any elements of the novel The Spy Who Loved Me. The storyline involves a reclusive megalomaniac named Stromberg who plans to destroy the world and create a new civilization under the sea. Bond teams up with a Russian agent Anya Amasova to stop Stromberg. The Spy Who Loved Me was highly acclaimed by critics. The soundtrack, composed by Marvin Hamlisch also met tremendous success. The film was nominated for three Academy Awards amidst many other nominations and subsequently novelized in 1977 by Christopher Wood as James Bond, The Spy Who Loved Me.